"The bright lights can blind you, as they clearly have in your case," Helga Swanepoel sniffed. "Country life has much to commend it, peace and quiet and a much slower pace than the continual traffic jams and rush of city life." "Such a slow pace it hardly has a pulse," Darleen sniped. "I'm also here under sufferance, looking after my frail mom who can't be transplanted at her age." Seeing that a quarrel was about to ensue, Miems Gouws quickly put a stop to it by suggesting, "Why don't you ask Elsie Fourie about Diwald? She'll know because he's her nephew and is now living with her and Japie." "I tried doing that," Christina du Plessis said peevishly. "A complete waste of time. She shut me down with the bald statement that he needed a change of scene and when I asked why, she said it was his business. Monkey business, if you ask me. He's probably in disgrace over something." "Not necessarily. Perhaps it's a love affair that went wrong. Perhaps his bride didn't turn up and left him standing forlornly at the altar," Suzie van Blerk suggested mischievously. "Who could blame her? He's a total nerd," Pat retorted. "I've become aware that Diwald, my nephew, is the source of much gossip and have even had people asking me," with a direct stare at Christina, "why he has chosen to come here. Well, he's had a set-back. He's a very intelligent young man who from childhood has always wanted to know how things work and how to put them right when they go wrong." She smiled before continuing. "When he was ten he dismantled the family piano to see how it functioned. It had to be sent back to the manufacturer to be put together again, and as a punishment, his father made him take piano lessons. It failed in its purpose," she added drily, "Diwald was intrigued with music notation and how it had to be translated, like a code, in order to be able to play what the composer had written. He became an enthusiastic pianist and since coming to Prentburg, has used that knowledge to learn the organ which he'd never played before. I think you'll agree that for someone who's only been here a fortnight, he's done pretty well, managing the basics of the double keyboard, the stops and the pedals. I guarantee that pretty soon he'll be expert at it." "If he doesn't decide to take it apart first!" Christina whispered in some alarm. "He's not ten years old anymore," Rina van Wyk reassured her; "clearly he just likes a challenge." "As I said, a real nerd!" Pat said under her breath, receiving a glare from the 'sisters' nearest her, who were intrigued with what they were hearing. "As he grew older, with exposure to all the gadgets of the modern world, you can imagine his interest in the developmental possibilities," Elsie continued. "From school he went to university, majoring in maths and computer science, concentrating on the problem-solving aspects of both software and hardware. He did brilliantly, was awarded a full bursary from a leading company to continue his studies if he'd work for them afterwards. He's now studying part-time for his doctorate and is still with the same company. However," she took a deep breath, "he had a... fall-out with a colleague which upset him greatly and has come here for a change of scene to help him get past it." She hesitated before continuing gamely, "Dominee Seibrand thought he needed something to take his mind off his troubles and offered him a job helping with office work. Diwald said he'd also try the organ when he heard we've been without an organist since Ma Gouws's arthritis made it impossible for her to play. Now you know the story, I believe you'll be understanding and supportive." She sat down abruptly, hoping that would put an end to all the rumours doing the rounds. Fat chance! All her efforts at quelling the talk about Diwald only resulted in feeding the curiosity of the church sisters, who were now more interested in him than ever! Diwald, who had so far found them a pleasant enough, if somewhat odd group of women, was surprised that they all seemed to find it necessary to come to the church office on some trivial pretext and stop to have a natter. Being an introvert he was not one for idle chit-chat, especially with strangers and, finding it unsettling, kept his answers short and to the point. 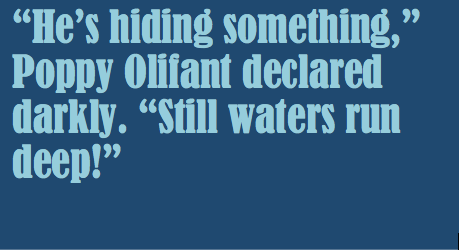 "He's hiding something," Poppy Olifant declared darkly. "Still waters run deep!" "He's certainly not forthcoming," Marie Minaar, receptionist at the Welcome Inn complained. She felt narked that her flirtatious efforts to draw him out had met with a blank stare and unintelligible growl; quite frightening, really! "He's the Norman Bates type," she added nastily, "capable of poisoning people with something like Novichok." "You're suggesting he's a Russian spy," Suzie quipped. Poppy ignored her. "Sisters, we need to find out what he's up to." "No good, if you ask me," Christina said grimly. "Anyone who can take an axe to a piano is capable of anything! "But he didn't," Sarie Blignault was bewildered, "he took it apart to see how it worked!" "Same difference," Christina snorted. "Some murderers dismember their victims." "Enough!" Helga put in hastily, seeing Sarie's distress, "Shame on the lot of you! Diwald's a nice lad who's been helpful and pleasant and all you can do is bad-mouth him." Diwald, meantime, continued to do his best to sort out some of the peculiarities that he came across in the church book-keeping, the filing system which was a lucky dip as the most unlikely papers found homes in files completely unrelated to their contents, and other administrative functions that seemed to have come into being without any reasonable thought being applied to their efficacy. It was like a labyrinth, he told his uncle and aunt with a laugh, but strangely, in some daft way, it all worked. Not as efficiently as it could or should, but it worked! "I'll drag them into the 21st century before I'm done here," he assured them. "The church computer, complete with tower, comes from the dark ages. That's first on my to-go list. Anna needs to learn how to create and use a spread-sheet, but not on that thing!" He got on well with the Dominee's wife, a down-to-earth woman who sorted out problems with a ruthless determination that he respected, even though some of her methods were alien to his way of thinking. "Anna takes aim at problems like a Cruise missile without considering outside factors that caused them, and blows them to hell and gone before they develop and become unsolvable," he said, shaking his head in amusement. "But once they've been sorted," his aunt pointed out, "she takes measures to prevent them happening again." "Does she? Then she's even cleverer than I thought!" Their curiosity still rampant, and life in Prentburg going through one of its dormant phases, the church sisters continued to speculate as to why Diwald left Johannesburg to come to Prentburg. "I bet there's a woman in the mix somewhere," Truida Spies said confidently, then as a thought struck her, gasped, "unless... it's a man?" "Listen, chaps, your womenfolk have got the wrong bit between their teeth and are running wild. They're now suggesting that our nephew, Diwald, is, well... gay!" His mates stared at him blankly, excepting for David Klopper. "If he is, does it matter?" he asked mildly. "Er, no, but he isn't and he's had enough upset in his life lately without doubts being cast on his sexual preferences!" Frikkie van Wyk quietly got up from his seat, gathered up his wallet and car keys and walked out of the club. "What's his case?" Klaus van Dyk asked, staring after Frikkie's departing back. "He's very conservative," Hans du Plessis explained, "and can't take any sexual talk." "What planet does he live on?" "Never mind that! Please, will you talk to your wives and ask them to respect Diwald's privacy?" Japie asked. "I'm going to tell you in the strictest confidence what has turned his life upside down, then you'll understand why he doesn't need more drama in his life through lies doing the rounds." "That's a bit much," Hans objected. "Our wives are not liars, only interested in what's going on!" "Well, they've misunderstood the situation. I'll explain as best I can, but it's a bit over my head, stuff I don't know much about." At the end of his rambling discourse, Japie's friends gathered that Diwald was one of a group of bright young employees tasked to work independently to improve on existing programmes for safe storage and transmission of computer data to prevent it being accessed by hackers. Diwald had risen to the challenge and was the first to complete the assignment two weeks before the due date, but was tardy in submitting it. He had, however, not reckoned on the dishonesty of one of his fellows, who had through devious means stolen his solution and presented it as his own. The irony was not lost on Diwald! It was the word of one young man against another and after some debate, the company directors decided that there would be an arbitration hearing to decide who was in the wrong, but this could only take place six weeks later when the CEO returned from visiting various European branches. In the interim the two competitors would be suspended on half-pay, the balance to be paid to the rightful owner once this was established, the other to be summarily dismissed. Diwald was shattered by the cold-hearted duplicity of his erstwhile friend, Colin, whose unruffled demeanour showed not a sign of remorse at his chicanery. "It's time this nonsense stopped. Diwald is innocent of any wrong-doing; he's the victim of a crime and needs our kindness, not criticism!" "The victim of what crime?" Christina asked eagerly. "Intellectual property theft, and that's all I'm going to say on the matter." Christina, quite unable to hold her tongue, told Marion she'd learned that Diwald had been robbed. "Poor chap, what was taken, his wallet? Cell phone?" Marion queried: "Cities are dangerous places." "I think he was at home at the time," Christina blustered, not knowing what Hilda had meant by 'intellectual property'. "All I can tell you is that property was stolen, which sounds more like electronic gadgets, TVs and computers, probably." In no time at all the sisterhood, to the last member, had been informed that Diwald had been robbed while he was in his flat, the story growing with each telling, so that the final version had him being assaulted and subdued with a stun-gun. Elsie shook her head when the news reached her and gave up trying to set matters straight, deciding it would only add fuel to the rumour-mongering flame. Sarie was the last recipient of the news and was very upset. "How could they hurt such a gentle person?" she asked, lips aquiver. All the church sisters were sympathetic. "No wonder he's so quiet," Mimi Viljoen empathised. "Poor young man, and we've been so suspicious of him!" "Sisters, we'll make it up to him," Helga promised. "We'll embrace him in the community, take him to our bosoms. Figuratively speaking," she added hastily. Diwald, completely unaware of all the hoo-ha doing the rounds, was now beginning to find life in Prentburg diverting. He had persuaded Anna that the church coffers could afford a new, state-of-the-art computer and driven her to Waterfontein where they had visited a number of stores before making their selection. At each outlet Diwald had discussed what was available with such insight that he received three job offers, cheerfully rejected, but which made him rather thoughtful on the way home. He was also becoming quite daring at the organ, adding flourishes to the hymns that kept the congregation on red alert! Not everyone was happy about his experimentation. "You never know where you are any more," crabby Mrs Merton grumbled. She had woken with a start when a sudden, loud chord had interrupted her catnap! He had also heard from his uncle that old man Davenport had an ancient police-issue Harley Davidson (once his favourite mode of transport but now well beyond his driving capabilities) somewhere in one of the outbuildings on his smallholding. "Do you think he'd be interested in selling it?" Diwald asked eagerly. "He may long since have got rid of it," Japie replied, "but we can always ask." Thus it was that Diwald pushed home the neglected motorbike. Japie arrived home long before he did and told Elsie: "It looks fit for the scrap heap. I doubt he'll be able to do much with it." "If anyone can, it'll be Diwald," she replied, "but with the pittance he's earning at present at the church, it'll likely take months, and hopefully he'll have his job in Jo'burg back long before then." Diwald was once again baffled by the behaviour of the church sisters. They arrived with gifts of fudge, cakes, fruit and other delicacies that he took home to his aunt. "They're really a weird lot," he told her. "First they practically ignored me. Then they were full of questions and chatter. Now they're showering me with attention and gifts. I don't know what to make of them!" Elsie hid a smile. "They like you. Enjoy their attention while it while it lasts; you'll likely be a one-day wonder until something or someone fresh arrives on the scene." "I hope it'll be soon," he muttered. "Whenever I've time on my hands I work on the bike in the church courtyard and soon have an audience of talkative tannies watching my every move. It's unnerving and I can't concentrate. I want to get the bike fixed so that Anna can be my first passenger in the side-car. I'll drive her to Waterfontein when she needs to go. She's been very kind to me." "That's one way to thank her," Elsie said drily, and when she next saw Dominee Seibrand, told him of Diwald's plans. He laughed merrily and couldn't wait to get home to apprise his wife what lay in store for her. Her eyebrows rose in alarm before her usual calm returned. "It's just as well then, Hendrik, that I've finally found a diet that works so I'll be able to fit into that contraption. It's also a good thing that it's going to take Diwald some time to restore the bike seeing I'll have to shed more weight than I intended!" Dominee was bemused. He knew that childless Anna had grown fond of the young man who had turned the church office upside down with his streamlining measures, which included training her how to use the new computer to best advantage. Would she really be willing to risk travelling in the side-car? Diwald trusted Anna enough to tell her the full story of his colleague Colin's treachery. "But there must be some way you can prove ownership of your proposal?" "How? Colin has the edge in that he submitted my work as being his before I'd got round to handing it in." "What about the research you did?" "Colin's intelligent and pretty glib. He's quite capable of quoting sources off the top of his head to back up his assertion that the submission is his," Diwald said helplessly. Anna gave this some thought before stating, "You must have worked through different stages to reach your final presentation. Did you keep a record of your progress?" "Of course; a detailed record, every inch of the way." "Then I suggest you use our fancy new computer to access it and present a clear explanation of every step you took leading to your proposal. Send it to whoever heads the group that'll decide your fate and ask that Colin be told to do the same. Surely your judges will have enough intelligence to be able to tell the difference between fact and fiction?" she encouraged. Diwald thought for a moment. "That's not a bad idea; it's certainly worth giving it a shot." He gave her a cheeky grin. "It's stored on my laptop, which is just as well, as you need every minute you can spare to learn all the functions the new computer offers compared with that dinosaur you clung to!" In the week before returning to Johannesburg to face the arbitration hearing, Diwald made frequent trips to Waterfontein for new parts for his motorbike, some having to be specially made at considerable expense by an engineering company as the old parts were beyond repair. Fortunately he had some savings he could dip into and did so without hesitation. The church office was running smoothly and efficiently with the new systems he had in place and, unexpected funerals aside when he was required to play the organ, he could plan his Waterfontein visits without neglecting his job, often being given a lift by members of the congregation who were going there. He spent the hours before the return trips doing research of a different kind. When he returned from Johannesburg, exonerated of blame and with the promise of a raise, Prentburg residents had mixed feelings. Happy for him that his reputation was unblemished, but sorry to be losing him as they'd become used to his quiet, quirky presence. "Why did he need to come back here? Surely he could have saved himself the expense by taking his things with him when he went to Jo'burg?" Elaine Ferreira asked. "He couldn't count on being acquitted, and anyway he has to make arrangements to get that wreck of a motorbike to Johannesburg," Helga replied, adding, "Elsie and Japie will miss him. They've enjoyed having him live with them." "Anna will miss him too," Marion remarked. A thought struck her. "We'll be without an organist once he goes!" Poppy, in charge of the choir, groaned. "Not again! It's impossible for the choir without one." Diwald surprised them by announcing he would not be returning to his old job in Johannesburg. He was going to start up his own business in Prentburg as there were endless opportunities for someone with his qualifications in the area. During his sorties to Waterfontein he had visited major businesses that were keen to give him maintenance contracts; there were also hospitals, schools, libraries, all needing computer training, maintenance and upgrading, not to mention creating websites and programmes for specific users. There were no local people available with the kind of expertise he could offer and he was confident he could make a go of it. Anna, usually so stoic, couldn't stop smiling, Dominee Seibrand offered Diwald premises in two unused rooms in the old wing behind the hall in return for remaining the official church organist, and even the most critical church sisters seemed pleased that he would not be leaving. "Prentburg's a nice, quiet place, Diwald, but just to put your mind at rest, perhaps you should join Sonja's husband Paul's judo class in our hall each Thursday evening?" She leaned into him and whispered, "It's always best to be prepared, isn't it?" 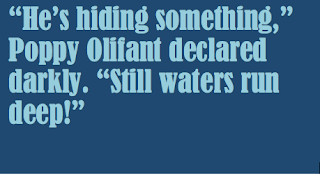 She trotted off happily, leaving Diwald with mouth agape. Judo classes were his idea of hell! Recalling her last comment, he began to feel uneasy. Prepared for what, exactly? A rip-roaring tale. I really enjoyed this one, Beryl. So true how rumors take on a life of their own and seem to feed and grow by those who spread the "news." I always enjoy reading about Prentburg, but something about your style in this story pulled me in and held on tight. Well done. I hope that Diwald's business flourishes and though the girls will have to find something else to gossip on, I have a feeling this is not the last we've heard of him! A very enjoyable and true-to life human interest story. I’m very sorry to learn about the flare-up of Ma Gouws's arthritis! Thank you Jim, Dave and Ceinwen for your comments and encouragement. It seemed time to give some attention to one of the men in Prentburg. The church sisters tend to hog the limelight. I wish you a Happy Christmas and a new year filled with blessings. I liked the story. It had well developed characters and took me to a specific place I could identify with even though I've never been there.